This section is for all the older GameStone related stuff. Zzap! World 64 - You'll find retouched cover scans for the Zzap! 64 Magazine, Apex Computer Productions gaming section with information on their excellent C64 games, also The Great Giana Sisters, Datahits and Thalamusic music cassettes. 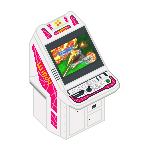 GSRcade - The quest for ultimate dexterity, various arcade joystick projects I've started over the years and some information on my arcade game collection including the Konami Windy II candy cabinet. Anime - This section has Anime related stuff like Marina Speaks Catgirl Nuku Nuku, music and information about the Japanese Seiyuu, Oomori Kinuko （大森絹子） (the voice of Priss from Kenichi Sonoda's - Bubblegum Crisis), CD release information and some music tracks to download. The Girl From Tomorrow - An Australian TV series about a teen-aged girl 'Alana' from the year 3000 who was forced to go back in time with the criminal 'Silverthorn' from the year 2500. Upon arriving in a rubbish tip in the year 1990, Alana escapes from the unconscious Silverthorn and runs into unfamiliar surroundings with her wrist computer, PJ as her only companion. Gradius Evolution - A Gradius fan game concept. (project permanently on hold). Gradius Legacy - An extensive 3D remake of the legendary Gradius series. (project permanently on hold). Cavadius - Official site for the Fan based vertical Gradius/Cave inspired Shoot'em-up for the PC, please note the project has been abandoned. Steve's Zone - Cameras, Yamaha motorbikes, how it's made, art work tutorials and more.